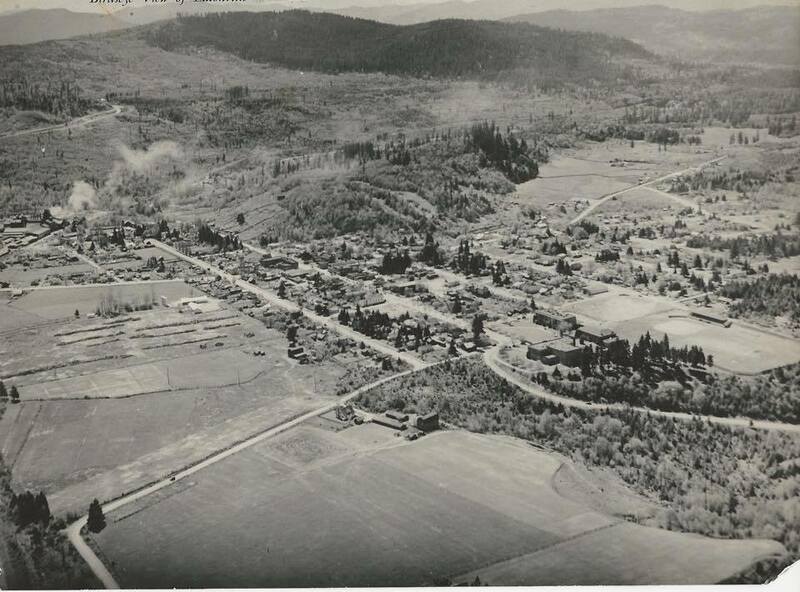 Saundra Hill posted this shot of the town on the Eatonville History Facebook page. I like that you can see the steam coming from the burner at the Eatonville Lumber Company. Very likely a photo taken from the plane of Jim Beech, the respected World War II pilot and lively local character. Most early aerial photos of Mount Rainier or the Ashford/Elbe/Eatonville area were taken from his plane. Jim Beech was the third husband of Mildred Ashford, youngest daughter of Ashford town founders, Cora J. (Hershey) Ashford and Walter Andrew Ashford. Mildred & Jim inherited the Ashford mansion on Canyon Road in Ashford. After Mildred died, Jimmy C. Beech continued to run his Mount Rainier Scenic Views flights out of his Ashford “airport” in what used to be all meadow along the side of Hwy 706 in “downtown” Ashford. Later Jim Beech rented his house to young Rick Johnson and his wife Jana Gardner who own and run Ashford Creek Pottery. Anyone else on this blog remember him from that time? Thanks again, Diane, for writing this very entertaining and educational history blog! Stories get lost in time unless someone motivates folks to share their attic photos and stories. Thanks to all of you who have shared photos and stories! Thank YOU for sharing. 🙂 This site is only as good as the stories people share.